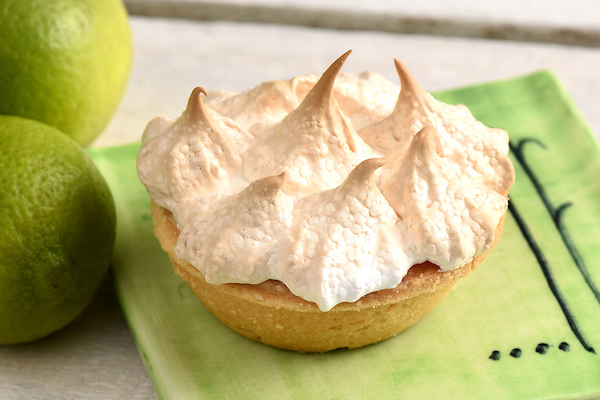 These amazing little lime tarts are delicious and perfect for when limes are in season. Use store bought tart cases for an easy way to impress guests. In a medium saucepan, mix the custard powder with a little of the coconut cream to a smooth paste. Mix in the remaining coconut cream, lime juice, rind and sugar. Cook, stirring until the mixture boils and thickens. Remove from the heat and beat in the egg yolks. Return to a medium heat and cook for about 1 minute or until the mixture comes to the boil again. Remove from the heat and use to fill the tart cases, taking the mixture to the rim of each case. MERINGUE Beat the egg whites and vinegar together until frothy. Slowly beat in the sugar Beat on full speed for about 5 minutes or until the mixture is thick and glossy. Spoon or pipe the meringue on top of the lime filling to completely cover it. Bake at 190 degrees C for 10 minutes or until the meringue is golden.